Born February 12th, 1974 in Senta, Serbia (then Yugoslavia) as a member of the Hungarian minority in the multiethnic region of Vojvodina. Completed his violin studies in Senta and Subotica and studied composition for four years at the University of Arts in Beograd under prof. Zoran Eric. 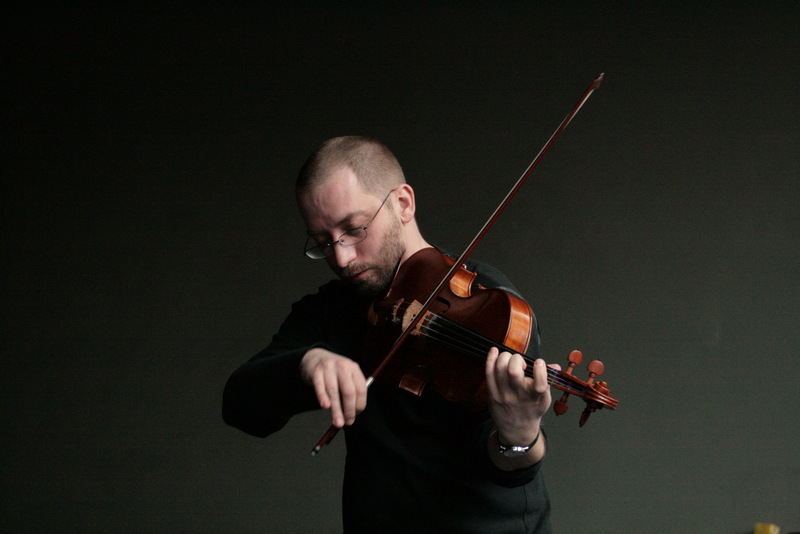 As violinist, violist, double bass player and composer and in various formations (from duo to nonett) held many concerts: Senta, Kanizsa (the “Jazz, Improvisative Music…” Festival 1995, 1997, 1998, 2000, 2002), Subotica, Novi Sad (all Serbia, then Yugoslavia), Maribor (Slovenija), Szeged (Hungary, ‘MASZK’ Festival 1994, 1997), Budapest (Hungary, ‘FONÓ’ 1997), Gyor (Hungary, ‘Mediawave’ Festivals 1992, 1994, 1995, 2003, 2006, also ‘Gyorfree Impro Workshops’ 2003, 2004, 2006), Gyergyószentmiklós (Romania), Leverkusen (Germany, ‘Leverkusener Jazz Tage’ 1991), Düsseldorff (Germany, ‘Düsseldorffer Altsadt Herbst’ 1996 – special prize for improvisation), Copenhagen and Aarhus (Denmark, ‘Magic Music Festival’ 1999), Kluj-Napoca (Romania, ‘Charta Minimumia Festival’ 2000), Odorhei Secuiesc (Romania), Beograd (Serbia, ‘Ring Ring Festival’ 2002, 2005), Pécs (Hungary, ‘Gassztro Fest’ 2002, ‘POSZT’ 2006), Kishegyes (‘Dombos Fest’ 2003), Copenhagen, Aero, Aalborg, Aarhus (Denmark, 2003 – tour with the Creative Workshop Ensemble), Debrecen (‘Debrecen Jazz Days’ 2003), Klagenfurt (‘CIK’, Austria, 2004), London (‘Klinker Nunhead’, 2005), ‘Cerkno Jazz Fest’ (Slovenia, 2006, 2007), Avignon 2006, Zagreb, Graz , Warszawa (Music Academy), Budapest (Music Academy), Gyor, Subotica, Novi Sad, Debrecen , Vác 2007, Dunajska Streda (Are You Free? Festival), Beograd (Ring Ring Festival 2008, Lasciar Vibrare festival), Budapest (Újbuda Jazz festival 2008), Ljubljana, Krakow (Krakow Jazz Fall 2008, Graz (Stockwerk). Since 2001, Mezei is closely collaborating with choreographer Josef Nadj, director of the ‘Centre Chorégraphique National d’Orléans’ in Orléans, France. Their mutual project ‘Les Philosophes’ was selected theatre-piece of the year 2001 in France. The play was performed with great success at the ‘Festival of Dance’ in Cannes, France 2001, in Avignon 2002, in Brugge (Belgium – the capital of European Culture for the year 2002), in Orléans in October 2002, in Paris in May 2003, in Reggio Emilia (Italy), in Le Havre, in Nantes (France) 2004, and in London 2005. In 2006 they collaborated on a new project ‘Asobu’ (together with co-composer Akosh S.). This play was premiered at the Festival d’Avignon in 2006, then successfuly toured Europe and Japan. His ‘String Trio’ was performed at the Festival of Contemporary Music ‘Ondine ’98’ in Rovereto, Italy . The composition ‘Trio for Flute, Piano and Percussion’ won the 3rd prize at the 7th International Review of Composers in Beograd 1998 in the category of student-composers. He got the ‘Sterija Prize’ for the music of the theatre-piece ‘Szelídítések’ (Tamings). In 2004 Mezei won also the prize for music at the 54th ‘Festival of Professional Theatres’ in Vojvodina (for the theatre-piece ‘Via Italia’). In 2009 He won the prize for composition in Theater Festival “Joakim Vujic, Sabac, Serbia for the music in theater-piece “Tempest”. As a performer Mezei participated in many workshops of improvised and intuitive music (with Tim Hodgkinson in Budapest, William Parker in Győr, among others). Played so far with musicians/improvisors like Matthias Schubert, Tamás Geröly, Róbert Benkő, György Szabados, Mihály Dresch, Michael Hornstein, Tim Hodgkinson, Albert Márkos, Peter Ole Jörgensen, Jens Balder, Joe Fonda, Michael Jefry Stevens, Joelle Leandre, Hamid Drake, Herb Robertson, Frank Gratkowski, Charles Gayle. His writings on music were published in many periodicals in Former-Yugoslavia and Hungary. He lead the Szilárd Mezei Trio, Szilárd Mezei Quintet (/ Sextet / Septet / Octet / Ensemble), and plays in many formations (duo, trio, etc.) for improvising music (among others, in duet with György Szabados, and with His orchestra MAKUZ, The Fonda/Stevens Group, Burány Quartet, duet with Albert Márkos).